SKU: PNK06. Categories: Party & Event, Miscellaneous Party, Casino Equipment. 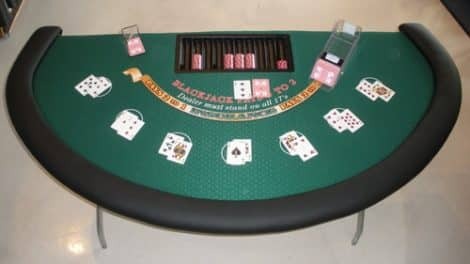 Tags: 21 table, blackjack table, casino table, twentyone table. This poker table is great for any poker or casino night and has room for 10 players and has a speed-felt top. It measures 42″ wide x 96″ long x 30″ tall. We also carry chairs, chips and decks of cards!